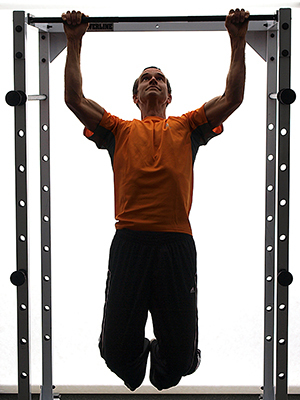 There are five fitness performance enhancers that can produce great results for our clients. Sleep is referred to as "the athlete's steroid" because human growth hormone is secreted during stages three and four of sleep. Proper hydration helps clients exercise harder and longer. Post-workout snacks start the process of muscle repair and preparation for the next workout, while myofascial release/foam rolling can decrease delayed onset muscle soreness both acutely and chronically. Finally, selecting the best circadian time to train has been proven to increase exercise performance by 10%. Review why sleep is referred to as the "athlete’s steroid." Understand the importance of hydration and the amount of fluids your clients need depending on intensity and duration of their exercise sessions. Summarize the best combination of protein and carbohydrate for a post-workout snack, drink, or meal, and the optimal time to consume it after a workout. 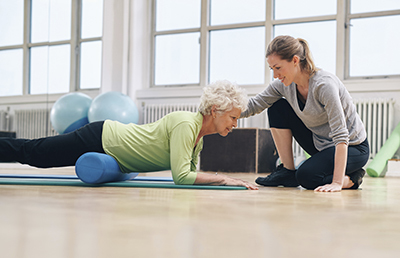 Discover how foam rolling can be implemented into a client’s warm-up and its role in decreasing delayed onset muscle soreness. Learn why exercising during peak circadian time can maximize your client's training performance. Stage one - A light sleep where we begin to lose muscle tone – the tension within a resting muscle - and it is the beginning of the loss of self-awareness. Stage two - A loss of nearly all muscle tone and is a light dreamless sleep. Stage three - The beginning of deep sleep, and is also known as “slow wave sleep” because the brain waves slow down. Stage three is important because this is the beginning of the secretion of human growth hormone. Stage four - The deepest kind of slow wave sleep and is important because this is when we replenish physical and mental energy. In stage four the body does most of its repair work and regeneration, and human growth hormone is continued to be released. Stage five - Referred to as rapid eye movement (REM) and is important for healthy brain functioning. This stage in which we experience dreams provides energy to the brain and body, and helps in the creation of long term memories. We also have periods of arm and leg paralysis which protects us from acting out our dreams. Most adults benefit from 7 – 9 hours of sleep each night; teens and pre-teens benefit from approximately 8.5 to 10 hours of sleep; and children ages 5 to 12 need 10 – 11 hours of sleep each night. However, some people, primarily adults, can be healthy with less sleep. Adequate sleep improves cognitive function, reaction time, ability to perform motor tasks, and it aids recovery from workouts. Additionally, sleep contributes to a healthy immune system, which is important for people who exercise on a regular basis because exercise, in and of itself, lowers immune function temporarily after a training session. Cheri Mah is quoted as saying, “Sleep is an important factor in peak athletic performance,” as well as, “Athletes may be able to optimize training and competition outcomes by identifying strategies to maximize the benefits of sleep.” One of the reasons performance and fitness can improve is that the body releases human growth hormone during stages three and four of sleep, which stimulates healing and growth of muscle, tendon and bone. Cheri Mah has conducted research on the effect of increased sleep duration on athletic performance. Her studies are compelling as it relates to improving performance for our clients. In one of her first studies, Mah (2008) tested college swimmers before they increased their sleep to ten hours per night for six to seven weeks. She tested the swimmers on 15 meter sprint, start time off the blocks, swim turn time, and kick strokes. After the swimmers spent six to seven weeks getting ten hours of sleep, they were tested again and the results showed they swam a 15 meter sprint 0.51 seconds faster, reacted 0.15 seconds quicker off the start blocks, improved turn time by 0.10 seconds, and increased their kick strokes by 5.0 kicks. In another study, Mah (2010) tested seven Stanford University football players. She indicates, “These athletes began their competitive season with moderate levels of daytime sleepiness and fatigue.” She wanted the football players to get a minimum of ten hours of sleep each night. Before sleep extension, they were tested on 20 yard shuttle run, 40 yard dash, and were questioned about day-time sleepiness, fatigue, and vigor scores (a measure of physical or mental strength and energy). The results of getting more sleep indicate the football players decreased 20 yard shuttle run time by 0.10 seconds, decreased 40 yard dash time by 0.10 seconds, and their day-time sleepiness and fatigue decreased significantly while vigor scores significantly improved. In 2011, Mah, et al., conducted the same study using male basketball players and tested them on shuttle sprint, free throw, and 3-point shooting. After five to seven weeks of sleep extension the basketball players were tested again and the results indicate they improved their shuttle sprint time by .07 seconds, free throw shooting improved by 9%, and 3-point shooting increased accuracy by 9.2%. Considering the improvements in performance of competitive athletes, adequate sleep can make a dramatic difference in fitness, health, and training of our clients – even if we just counsel them on increasing sleep by only thirty to sixty minutes per night. For some clients, if sweat loss is slight, dehydration may not be an issue. But for others who are either exercising harder or sweat more, hydration is more important. For our older clients, aging causes changes in body water composition, renal function, and thirst perception declines (Davies, et al., 1995). Interestingly, Popkin, D’Anci, & Rosenberg, (2010) indicate that despite water’s importance, the available research that serves as a basis for determining requirements for fluid intake, or even recommendations for humans, is limited compared to most other nutrients. However, a general rule is that clients should drink 16–24 ounces of fluid post-workout for every pound of body weight lost during activity. The best advice is to sip fluid throughout the day. Proper hydration increases blood volume, thins blood, decreases heart rate, and makes it easier for the body to lose heat. When a client is hydrated, exercise will “feel” easier, and therefore allow the clients to increase intensity and workout longer. It is important to talk to the clients who sweat a lot about complete hydration requiring sodium and potassium replacement. Plain water may not enough for certain clients. When exercisers are provided plain water, most only replace a fraction of their fluid losses because water “turns off” thirst too soon. 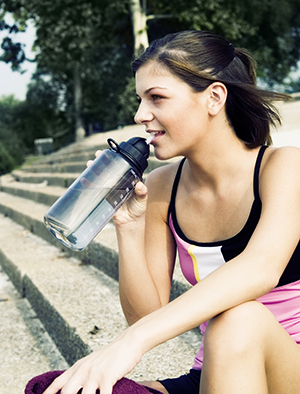 Exercisers drink more when given a flavored beverage. Lightly flavored waters with few calories (often <25 Kcal/serving) can help hydration by stimulating thirst. Most commercial sports drinks provide 50–80 calories and contain 14–17 grams of carbohydrate per 8 ounces (Stover & Murray, 2007). This is 6%–8% carbohydrate solution maximizes gastric emptying so that clients will not feel bloated, it enhances fluid absorption from intestine, and supplies energy to the muscles (Sawka et al., 2007; Coombs & Hamilton, 2000). There are three goals of sports drinks: 1) prevent dehydration, 2) replace electrolytes (sodium and potassium), and 3) provide carbohydrates for use during exercise. There is a misconception that not all fluids are good to drink. The fact is there are many “functional fluids” including: water, flavored water, sports drinks, soup, juice (regular or diluted), low fat milk, tea, coffee, herbal tea, lite beer, fruit (watermelon is 90% water, oranges, grapefruit, cantaloupe and honeydew melon), and even soda (regular or diet). The fact is that all fluids can be used for hydration. Grandjean (2000) proved this in her study using caffeinated, non-caffeinated, soda and diet soda drinks. Eighteen males, on four separate occasions, consumed water or water plus varying combinations of beverages. Body weight, urine and blood assays were measured before and after each treatment. The results indicate no significant difference in the effect of various combinations of beverages on hydration status of healthy adult males - the source of fluid did not matter when the outcome was hydration. According to the results of this study, advising people not to drink caffeinated beverages for hydration was not substantiated. Killer, Blannin, and Jeukendrup (2014) found no differences in hydration (with moderate daily coffee intake) in people who drank caffeine on a regular basis. They conclude that coffee, when consumed in moderation by caffeine habituated males, provides similar hydrating qualities to water. Similar to hydration, post-workout snack may be most important when a client is working out for 60 – 90 minutes with moderate to high intensity exercise. There are two primary reasons for a post-workout snack: 1) to replenish glycogen stores that are depleted by high intensity exercise or long duration training in order to start the process of preparing for the next workout, and 2) to consume some protein to help the process of muscle repair. With reference to the nutrients, the position stand indicates that a post-exercise (within 30 minutes of a workout) consumption of a carbohydrate snack (8 – 10 g CHO/kg/day) has been shown to stimulate muscle glycogen re-synthesis. But adding protein (0.2 g – 0.5 g PRO/kg/day) to the carbohydrate snack at a ratio of approximately 3:1 carbohydrate-to-protein has been shown to stimulate glycogen re-synthesis to a greater extent. Post-exercise consumption (immediately after exercise to 3 hours) of amino acids (primarily essential amino acids) has been shown to stimulate greater increases in muscle protein synthesis. Protein synthesis is the process of the protein getting into the muscle cell to begin rebuilding the damage that exercise has done to the muscles. However, ingesting 6 – 20 grams of essential amino acids and 30 – 40 grams of high-glycemic carbohydrate within three hours after exercise, and immediately before exercise, has been shown to significantly stimulate muscle protein synthesis. In addition, daily post-exercise ingestion of a carbohydrate and protein snack stimulates greater increases in strength, improvements in muscle tissue and body fat percentage during resistance training. Finally, Pritchett and Pritchett (2012) indicate that chocolate milk is an affordable recovery beverage for many athletes. Low-fat chocolate milk consists of a 4:1 carbohydrate-to-protein ratio and provides fluids and sodium to aid in post-workout recovery. Consuming chocolate milk immediately after exercise and again at two hours post-exercise appears to be optimal for exercise recovery and helping to repair muscle damage. Foam rolling is kind of the new “stretching.” There are numerous studies on foam rolling; mostly focused on reducing delay onset soreness, range of motion before and after foam rolling, and whether foam rolling has an effect on athletic performance. MacDonald et al., (2013) investigated whether foam rolling would reduce delayed-onset-muscle-soreness. The subjects where divided into to a foam rolling group and a control group. All subjects performed 5 different testing sessions, which included tests performed both pre- and post-workout (at 0, 24, 48 and 72 hours). The workout was intended to create delayed onset muscle soreness (10 sets of 10 reps of squats at 60% of 1RM, 4-second eccentric and 1-second concentric, 2 minutes rest between sets). The subjects in the foam rolling group performed several foam rolling exercises for 2 bouts of 60-seconds per exercise at 0, 24, 48, and 72 hours. The researchers found that muscle soreness was significantly reduced in the foam rolling group in comparison with the control group at 24, 48 and 72 hours post-workout. The researchers concluded that foam rolling produced significant reductions in muscle soreness at all time-points. Jay et al., (2014) investigated the effect of roller massage on hamstring soreness directly in one leg and also the potential cross-over effect to the non-roller massaged leg in 22 healthy, untrained subjects. Subjects were in the roller massage group or a control group. On one day, all subjects performed 10 sets of 10 reps of stiff-legged deadlifts with a kettlebell, separated by 30 seconds of rest with a tempo of 1 – 2 seconds for the concentric and eccentric phases. Forty-eight hours post-workout, the subjects returned and rated their hamstring soreness using a visual analogue scale, and the researchers tested their pressure pain threshold through palpation. The subjects in the roller massage group received foam rolling treatment on one leg. Measurements of soreness, pressure pain threshold and flexibility were taken before and at 0, 10, 30 and 60 minutes post-foam rolling. The researchers indicate that the roller massage group displayed significantly reduced soreness and greater pressure pain threshold compared with the control group at 0, 10 and 30 minutes post-massage. Finally, in regard to athletic performance, the current evidence suggests that foam rolling does not adversely affect athletic performance measures, such as muscular strength, power, jumping and agility. Additionally, it seems that in this respect, foam rolling is superior to static stretching (Halperin et al., 2014; Sullivan et al., 2013). Most peak performances occur in the early evening, when there is a peak in core body temperature. An increase in core body temperature is beneficial to performance and fitness because it increases energy metabolism, improves muscle compliance, and facilitates the actin-myosin cross bridging which improves muscle contraction. As this relates to training clients, it is hard to get clients to select when they have the highest energy and tell them to come to you to train at that time. However, if a client is not getting the results he or she wants, there may be an opportunity to discuss with them what time of day or evening might be better for them to train to get the maximum benefit from the exercise. Or at the very least, if our clients train early in the morning, it is important to perform a very active warm-up to increase body temperature. Considering the dramatic effect that improving sleep patterns can have on fitness and health, it could be prudent to have discussions with clients about their sleep. Suggestions about increasing the amount of sleep a client gets could be the answer to losing weight or improving performance. The increases in sleep can be gradual, adding fifteen to twenty minutes per week. Many clients know and understand the importance of hydration, but some may not understand how it can improve their workouts. Moreover, many clients may not understand that there are many fluids they can drink to stay hydrated, such as flavored water instead of plain water. Although some clients may not need a post workout snack, many of our clients, especially athletes, can have good benefits to their fitness and performance by eating a snack or having something to drink after they workout. This is especially true for clients who are strength training or performing exhaustive exercise that requires carbohydrate and protein when they are done. Foam rolling appears to be a good tool to use before and after a workout. Before a workout it can decrease delayed on-set muscle soreness and improve performance. After a workout it can be used the same as stretching in a cool-down. Finally, it is apparent that exercising when the body has its highest energy can boost fitness, so if a client is not getting the results he or she wants this may be a something to consider to help achieve the desired results. In addition, the body performs best when it is warmer so a dynamic warm-up for early morning training is essential. Coombes, J.S., Hamilton, K.L. (2000). The effectiveness of commercially available sports drinks. Sports Med. 29(3):181-209. Davies, I., O'Neill, P., McLean, K.A., et al. (1995). Age-associated alterations in thirst and arginine vasopressin in response to a water or sodium load. Age Ageing, 24:151-9. Grandjean, A. C., et al. (2000). The Effect of Caffeinated, Non-Caffeinated, Caloric and Non-Caloric Beverages on Hydration, J Am Coll Nutr. Halperin, I. et al. (2014). Roller massager improves range of motion of plantar flexor muscles without subsequent decreases in force parameters. Int J Sports Phys Ther, 9(1):92-102. Jay, K., et al. (2014). Specific and cross over effects of massage for muscle soreness: randomized controlled trial. Int J Sports Phys Ther, 9(1):82-91. Kerksick, C., et al. (2008). International Society of Sports Nutrition position stand: Nutrient timing, Journal of the International Society of Sports Nutrition, 5:17 doi:10.1186/1550-2783-5-17. Macdonald, G.Z., et al. (2014). Foam rolling as a recovery tool after an intense bout of physical activity. Med Sci Sports Exerc, 46(1):131-42. doi:0.1249/MSS.0b013e3182a123db. MacDonald, G.Z., et al. (2013). An acute bout of self-myofascial release increases range of motion without a subsequent decrease in muscle activation or force. J Strength Cond Res. 27(3):812-21. doi: 10.1519/JSC.0b013e31825c2bc1. Popkin, B.M., D’Anci, K.E. and Rosenberg, I.H. (2010). Water, hydration, and health, Nutr Rev. 68(8): 439–458. Pritchett, K. and Pritchett R. (2012). 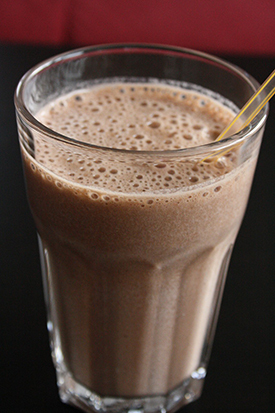 Chocolate milk: a post-exercise recovery beverage for endurance sports, Med Sport Sci. 59:127-34. doi:10.1159/000341954. Epub 2012 Oct 15. Stover, B. Murray, B. (2007). Drink Up! : The Science of Hydration, ACSM'S Health & Fitness Journal, 11(2), 7-12. Sullivan, K.M., et al. (2013). Roller‐massager application to the hamstrings increases sit‐and‐reach range of motion within five to ten seconds without performance impairments, Int J Sports Phys Ther. 8(3): 228–236. Teo, W. Newton, M.J. and McGuigan, M.R. (2011). Journal of Sports Science and Medicine, 10, 600-606.